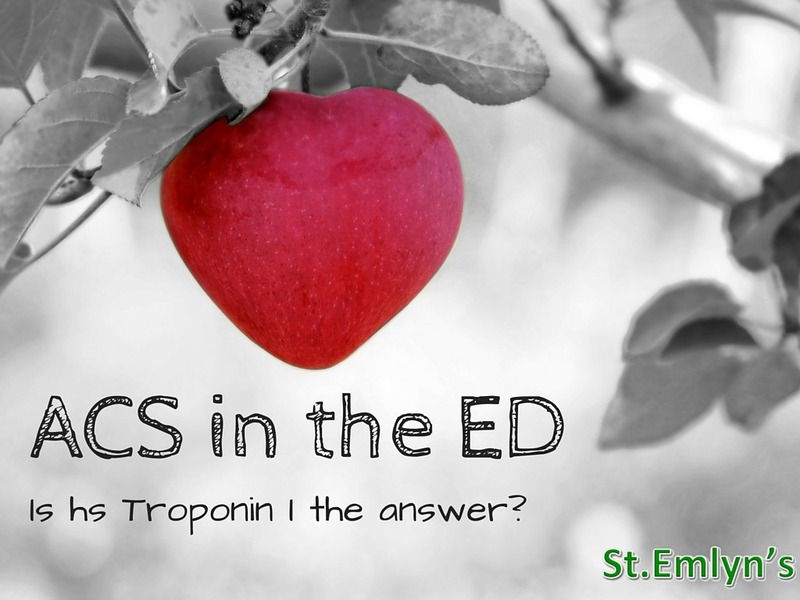 As you surely know we love thinking about Troponin at St.Emlyn’s. We have our own world expert in Rick Body and there is loads of stuff here on the site about the use (and abuse) of Troponin as a diagnostic test. Click here to see past posts on Troponin. 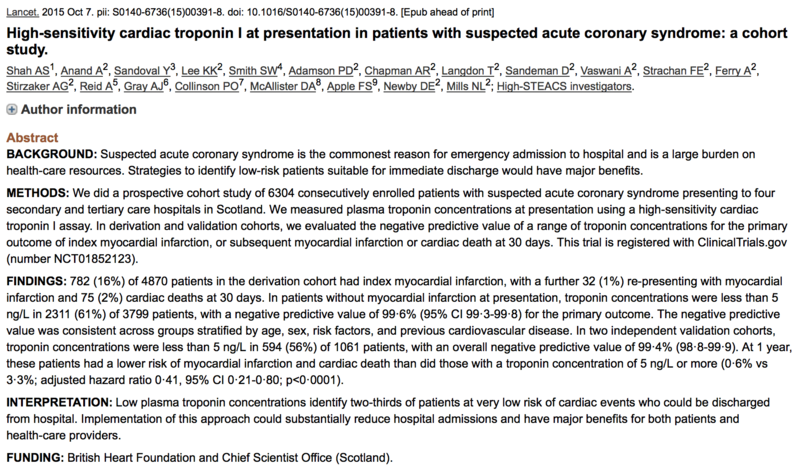 In Virchester most of our research has been looking at high sensitivity Troponin T, but of course there is another cardiac protein, Troponin I, that can also be detected in the blood. Colleagues in the UK share our interests in rule out strategies and so it’s great to see a paper published in the Lancet on the use of hs-TnI as a rule out strategy for ED chest pain patients. This study, funded by the BHF, is well worth a read and is currently open access. Have a look at the abstract below, and as we always say, please read the paper in full by clicking here. This is a diagnostic cohort study, well arguably it’s three studies. They first derived a test threshold as a rule out strategy with the subsequent two studies designed to validate the findings from the first study. This split between derivation and validation cohorts is so important as when a research team initially derives a value or decision rule it will always ‘fit’ really well against the original cohort. This is so obvious if you think about it as the process is circular – you derive a value from a group of patients and then decide whether it predicts in the group you derive it from – if you do that then of course it will! Very obvious but it’s something that is done suprisingly often. So, in this paper we have a derivation and validation cohorts and that’s a good thing. Arguably we could have seen a different design, such as a randomised controlled trial with 30 day all cause mortality as an outcome, but the research may not yet be at that stage and it may be something we see in the future. Patents with suspected ACS in the ED were screened and enrolled into the trial. Troponin I was taken at baseline, 6 and 12 hours. Patients were treated according to a NON high sensitivity troponin, but at the same time they took hsTnI levels (these were not given to the treating docs). This is important as in this study we can see what ‘might’ happen in practice but not what ‘would’ happen if the results were available to clinicians (in other words we don’t know if these results would really change real world clinical practice). Pretty standard fare for these trials. The universal definition of MI was used and patients followed up for 30 days. That’s what we do here in Manchester and it’s a fair and understandable way of interpreting the data. They also followed patients up to one year looking for further myocardial events. 6304 patients were recruited, with 4870 n the derivation cohort and 1126 in the validation set. In the derivation group a hsTnI of <5ng/L had a negative predictive value of 99.6 % (impressive), with 61% of patients having values less than 5ng/L (very helpful – potentially). Let’s remember thta NPV takes prevalence into account though so the sensitivity is different….you need to dig in the supplementary material…. Not quite so impressive as the NPV, but still pretty good when looking at an overall cohort of ED patients. Remember though – the NPV/PPV includes the prevalence so if the prevalence changes so does the NPV/PPV. At one year patients with a hsTnI less than 5 did better (0.6% event rate vs. 3.3%). The data supports the idea that low hsTnI in patients presenting to the ED are associated with a good prognosis and a low incidence of myocardial events at 30 days and at a year. That’s great to know. There are other aspects that I would want to know more about though. The group of patients tested appears to be quite diverse. Patients with suspected ACS form a broad group and in the supplement you can find that 30% of patients had abnormal ECGs in the validation set and 41% had abnormal ECGs in the derivation set. Clearly this is a diverse group of patients and that does not necessarilly reflect the way that we practice in the UK. In Virchester we stratify patients according to pre test probabilities and I think that’s how tests should be used. I would want to see how this data performs when combined with a clinical decision rule (e.g HEART or our own lovely MACS). I suspect that will reflect clinical practice better and also help us determine the test characteristics in different pre-test probability groups. So what now? Shall we all use hsTnI? The data supports the use of hsTnI as a decision support tool for the emergency and acute physician. However, without an analysis linked to pretest probability I am a little cautious at the moment to just use this number. The bottom line is that this is a great study in a fascinating area. My belief is that hs Troponins do have a role in the early diagnosis and risk stratification of patients with symptoms/signs of ACS but you still have to engage the brain and read the ECG. The reported NPV is impressive, but the sensitivity is lower than I would hope for in such a serious disease, and I would really want to know how it performs in different populations. Chest pain posts from Core RCEM curriculum (CAP7). Chest pain posts from the HST RCEM curriculum (HAP8). Previous: Previous post: The Turban Technique – A Scalp Bandage that Stays! I was an author of the study, and it is a bit tricky: Patients with initial hs Trop I > gender specific 99% were first identified as patients who would require further evaluation for MI (n= 1071 of 4870 patients, leaving 3799 patients with an initial troponin < the 99% level). Only then was a cutoff for "rule out MI" assessed. The number who were ruled out was then 2311 of 3799 patients (61%), but only 2311 of the original 4870 (47%). Thus, any high risk patients were identified early and left out of the subsequent analysis, making the subsequent pretest probability much lower and (probably) equalizing it among centers with a high vs. low incidence of MI. Thus, the negative predictive value is much more likely to apply generally than only specifically to our centers and is probably just as useful as sensitivity. On the other hand, a lower number of patients can be "ruled out," at 47% (vs. 61%). This could have been much more clear in the paper.